I am on the second week of the Gracie Diet, the second phase in week. No snacking, four and half hours between meals, and food combination awareness. The hard habit to break is the American wheat and potato combination. example, fries with hamburger or chips with a sandwich. I broke down one day, but tried to observe how I felt. The next day, I got back to the plan. One thing that I am enjoying is a five banana smoothie which is addictive and very healthy. After consuming, I can go from 8:00 am to 12:30 pm, without snacking, no problem. See you tube video on benefits of eating bananas. Note, you should brush your teeth or rinse your mouth after consuming. I know of a professor’s child, whose on the Gracie Diet, that had a cavity. Fruit has sugar. Rotting bananas can be frozen but they have to be unpeeled first. I use bags from empty frozen vegetables to store them. The frozen bananas need to be thawed so you can put them in the refrigerator the night before. One thing I am thankful for is Iyengar yoga, yogarosa.com, which has helped heal my shoulder. I can now reach above my head for an empty glass from the cabinet without any pain. Anyways, I am looking forward to getting back to training. 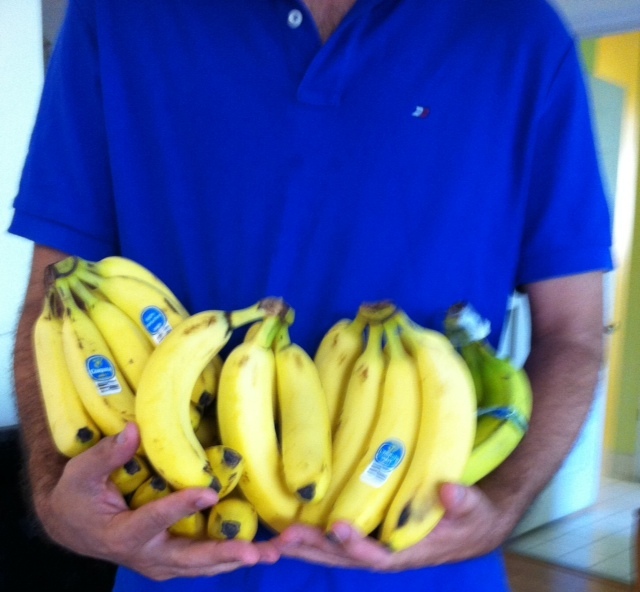 The most bananas I ever bought. I am experimenting with the Gracie diet. I will probably start the 14 day meal plan as in the book after Thanksgiving, November 24. The word diet in the catch phrase, Gracie Diet, is miss leading because I am not trying to lose weight at all but to increase my energy level and obtain better health. All week, I have been drinking a banana drink for breakfast. During the week, I ran out of almond milk for a four banana smoothie which turned out to be a good thing because I used a quarter cup of filtered water instead in the blender. The almond milk may have stopped the feeling of complete fullness. So, I drank the banana drink at 7:30 am. On that day, I had an old habit of eating a big breakfast around 8:45 am at Wholefoods after dropping my kids off at school. To make this short, when I arrived at Wholefoods, while I sat in my car in the parking lot, the last thing I was thinking of was stuffing myself with scrambled eggs and bacon, I was there out of habit. Fortunately, I had the feeling of being full from the banana drink with water. Also, I didn’t eat any pork because pork is not part of the diet. All pork is off the menu. I realised I spend a lot of time eating when I don’t need to be, snacking and over eating, plus I saved some money. I need to stop over thinking and just do. I’m worried about getting injuried and stepping out of my comfort zone to push myself to a higher level. I felt that I needed time off to get my head straight and to heal. I went through something like this, taking time off to prepare myself mentally for tougher competition, because I moved to a higher weight class in judo. I left for a while but I learned that I missed judo competition and would have comeback but moved. One thing that I remember about my judo training as a kid, many, many, many years ago, which kept me coming back, I used to train with my best friend who was stronger and smarter than I was. We were in tremendous competition against each other all the time. I rarely beat him. That was the best training for competition and for life. This week I started Iyengar yoga classes to try and fix my shoulder, old sports injury. I prefer yoga over physical therapy. I am doing it twice a week. I am not a fan of yoga. I find yoga painful and difficult. What exactly is Iyengar Yoga? Iyengar Yoga is a type of yoga that uses props to get you where you need to be. Because of Iyengar's frail health as a child, he created a special type of yoga that uses props. Today, he is one the most recognized yoga teachers in India. If your in South Florida area and your interested in learning yoga correctly, I recommend Iyengar yoga at Yoga Rosa of Hallendale, Fl. See web page. yogarosa.com. Most of the teachers have been to India and many years of experience. It is intense, or as intense as you want yoga to be. What I like about Yoga Rosa is that is all it is, yoga. No free weights. No spinning cycles. No aerobics. It's not a gym. That is something I like about Valente Brothers also. You go there to study Jiu Jitsu. It is not a gym either. Getting back to the Gracie Diet, I am on chapter five of the Gracie Diet Book. I started the log book chart in that chapter. I would like to dive right in but I don’t have a firm grasp of the rules and they recommend doing a three phase in. Start with small changes. I learned that I snack all day long. This week I started reading, The Gracie Diet. Also, I have been taking it easy for the last two weeks with a shoulder muscle injury. Supraspinatus strain. Unfortunately, rest is the cure. If I need more time to heal, I could go to class as an observer. I may do that. Reference the Gracie Diet introduction, my daughter wanted M&Ms because she went to choir practice. I told her she had to ok it with her mother. She said okay. We went to Publix, a local Florida grocery store, it is like Safeway, Winn Dixie, or Giant. It was very crowded. I was hungry. I bought a candy bar and an energy drink while waiting in line. We ate and drank the unhealthy snack food in the car. I forced my self to eat dinner because I had ruined my appetite. Now that I think about it, I would shop at Publix at least three times a week and I would buy something unhealthy. After reading the introduction and doing some thinking, I decided that I am not going to shop at Publix anymore. I call it, avoiding a dog’s death. What do I mean? I want to avoid my inner self by not engaging it in a losing battle, unhealthy junk food. A samurai is dishonored if they die in battle without accomplishing the goal. It is ok to retreat so that the battle can be fought another day for a better chance at victory. In this case, I will avoid the unhealthy food all together.